For many reasons the food-pack always ends up being the heaviest pack on every trip. We tend to bring more food than is necessary, simply because we don't want to run out and you definitely can't count on catching fish to sustain you. So, in order to make the food-pack less of a chore, we tried to shave weight where ever possible. Step one was the cookware. Thanks to modern materials and innovative design Primus Camping is able to package a 3-piece cookware set that takes up less space in your pack than a football and weighs in at less than 2 pounds. Constructed from hard-anodized aluminium with a titanium non-stick interior coating, they perform incredibly well and clean up easily (even with the eco friendly camp soap). I was impressed with how quickly these pots and pans came up to temperature and even in windy conditions. 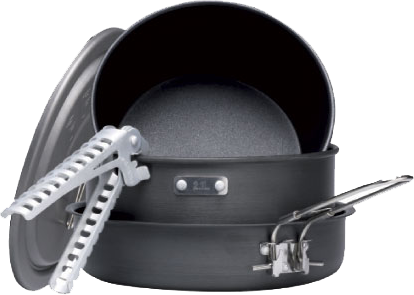 The handles functioned better than many of the collapsible options on the market and did an excellent job of dissipating heat so you don't fry your fingers. I am by no means a chef, but cooking with these made my life easy. This set-up will easily handle full meals for up to about 4 people. For groups larger than that the size starts to inhibit portion size. We had to bust out the old school giant skillet to keep up with our 7 man BWCA crew. This kit will make it on the final gear list for many trips to come, it's perfect for just about any back-country kitchen.